I don’t know if you’ve looked around lately, but the world that we live in is moving fast and it’s getting faster everyday. The need for speed reigns supreme. File downloads that used to take days are now finished in a matter of minutes. Monetary transactions that used to take minutes to process now take mere milliseconds. The technology of today’s world is evolving at a lightning fast rate and before it’s even had time to become relevant it, too, is replaced by something that’s even faster and more compact. Everything these days is connected to everything else. And with this interconnection, it was inevitable that a means of trading with one another across physical boundaries without the need for oversight or currency exchange would emerge. Enter cryptocurrency – electronic money that uses complex cryptography so that it can be securely moved from one individual to the next. Bitcoin, the original cryptocurrency, was first introduced in 2009. But it didn’t stop there. As the popularity of Bitcoin grew, other people began making their own cryptocurrency. As of this writing, there are over 1,800 different forms of cryptocurrency in existence and that number is growing almost every day. It’s a huge space and there’s a lot to learn to avoid getting scammed… because not every cryptocurrency is legitimate. The lack of oversight means that cryptocurrency runs on the honor system. And not everyone is honorable. In an effort to educate people about the way this complex system works, Singapore-based Capital Gains Studios brings to you Cryptocurrency – a game about investing in and manipulating this digital cash in order to become the wealthiest investor. During the game, players will be investing in various types of cryptocurrency and using the abilities of their investment team members to manipulate the price of the market so that they can buy low, sell high, and make bank. But beware! At the end of the game one or more of the currencies will be revealed to be a scam and will become worthless. Will you become the next digital tycoon or will you be left a techno-pauper? Only one way to find out. Before you begin playing, you’ll arrange the 4 Info Boards in the middle of the table, placing one of the Mining tokens onto the first space of each progress track. These Info boards are how you can tell how difficult it will be to “mine” coins, the rewards for successful mining attempts, as well as the fees collected for “validating transactions”. These boards are also where players will be placing the Rumor cards that will cause the prices of the various cryptocurrencies to fluctuate. All of these elements will be explained in due course. Next to these Info boards is placed the Market board with the requisite amount of each coin placed into the Market Supply area and the price trackers for each coin set to their starting prices. The remaining coins are set off to the side into an “unmined coins” area. Once these boards have been arranged, it’s time to dish out the various cards. First, the Rumor cards are shuffled and two cards are dealt to each coin type. One card is placed face up and one is placed face down without looking at it. The remaining Rumor cards are set to the side in a deck. This initial placement of Rumor cards will cause the price of the coins on the Market board to adjust either up or down. The Expert card deck is shuffled and five of these are turned face up next to the deck. Next, the Transaction cards are shuffled. Three of these are placed face down next to the deck so that only the images on their backs are showing. These images correspond to the different cryptocurrencies. All of the other cards – the Ultimate Hodler* cards, the Loan cards, the Hash cards, and the Wonga cards (the fiat currency in the game) are set close by. Finally, each player receives 3 Intern cards (which form your Team) and 6 Wonga to begin the game. Once all of this has been done, a start player is selected and you’re ready to begin. *in cryptocurrency lingo, the term “hodl” is short form for “hold on for dear life”. A hodler is a person that hoards their coins through thick and thin in the hopes that they will eventually gain value. Cryptocurrency is played over the course of five rounds. At the end of each round, the player to the left of the starting player becomes the new start player for that round. In the first phase of each round (the Prep phase), the players will take turns drawing a Rumor card into their hand and then deciding whether or not to take a Loan card. 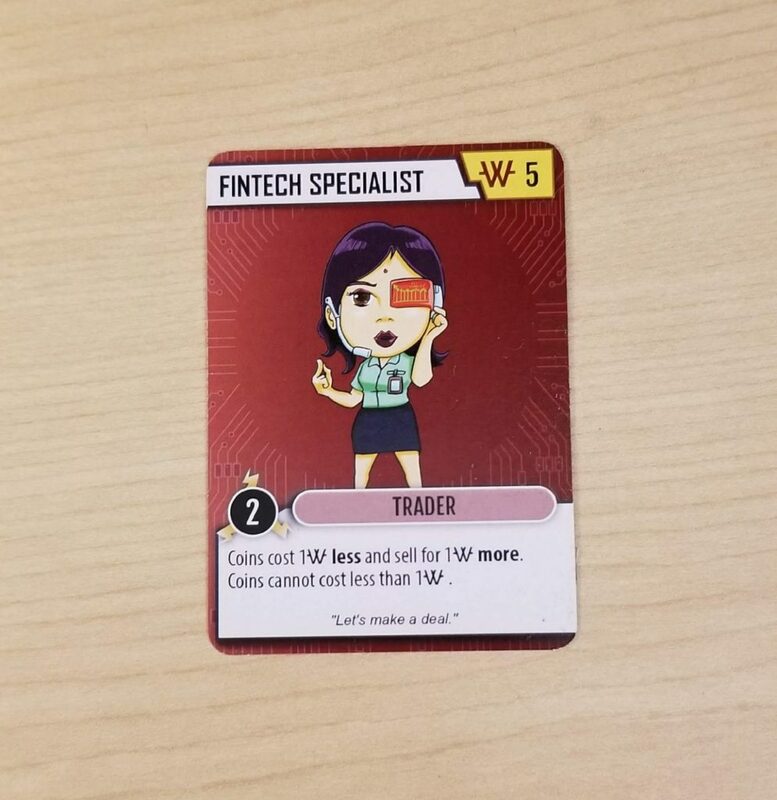 Then each player, in order, will have the opportunity to hire one of the job seekers from the lineup of Expert cards to add to your Team of experts. You’re only ever allowed three Team members. Hiring a fourth would force you to replace one of your existing Team members. Each Expert costs a certain amount of money to hire and will provide some amount of energy (used to perform actions) as well as a special ability. For instance, the Fintech Specialist costs 5 Wonga to hire, provides 2 energy, and has an ability that makes it cheaper to buy coins or makes coins that are sold more valuable. In the second phase of each round (the Action phase), the players will take turns performing actions until all three of their Team members are exhausted (flipped face down). There are two actions for the player to choose from during their turn – Mining or Trading. Mining coins (introducing new coins into the game) can be risky. When a player chooses this action, they must first choose which currency they are going to mine and then invest energy. The more energy that they invest, the higher the likelihood of a favorable outcome. 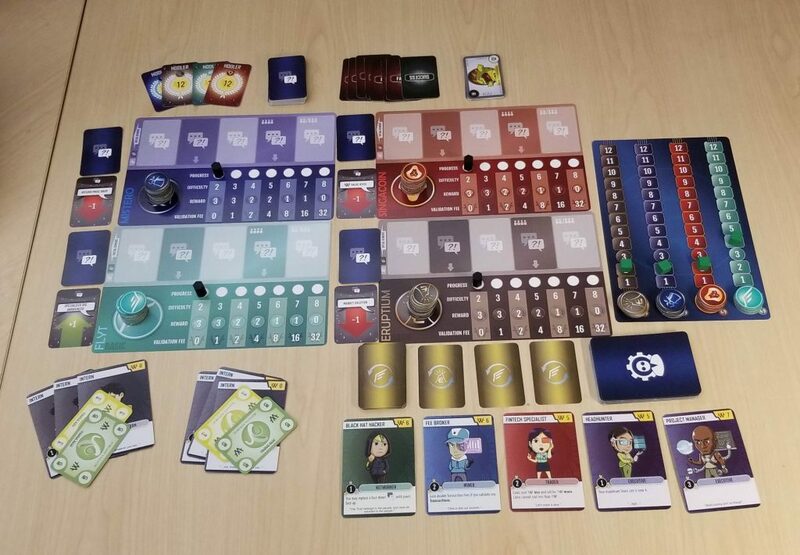 Once the player has invested their energy by turning a number of their Experts face down, another player will shuffle the Hash cards into a Hash deck consisting of the Success card and one Failure card until they reach the level of difficulty that the chosen currency’s Mining token is sitting on. In this example, the player has chosen to mine for Eruptium. Eruptium’s Mining token is currently sitting on the Progress track above the number 3. This means that the Hash deck will have contained 1 Success card and 2 Failure cards. The active player has invested 2 energy and revealed the Success card. Now they look at the reward row and collect 3 Eruptium coins from the unmined coins area and add them to their personal supply. Any ongoing transactions that show the Eruptium symbol on the back (of which there is 1) are turned face up. This earns them the number of validated (flipped over) transactions times the amount of the validation fee in Wonga. In this case, they only earn a single Wonga for their efforts. Then the Mining token moves up a space on Eruptium’s progress track. If a player does not reveal the Success card, then their efforts were for naught and their turn ends. Trading coins is the process of buying coins or selling coins from or to the Market board. Buying and selling is easy. First, the active player invests energy into the action. For each energy invested, they can either buy up to 4 coins or sell up to 4 coins. If they buy at least 4 coins, then the price for that particular currency increases by 1 for every 4 coins purchased. If they sell at least 4, the price tracker for that currency moves in the opposite direction instead which causes the price to decrease. This increase or decrease in price is referred to in-game as a “market shift”. 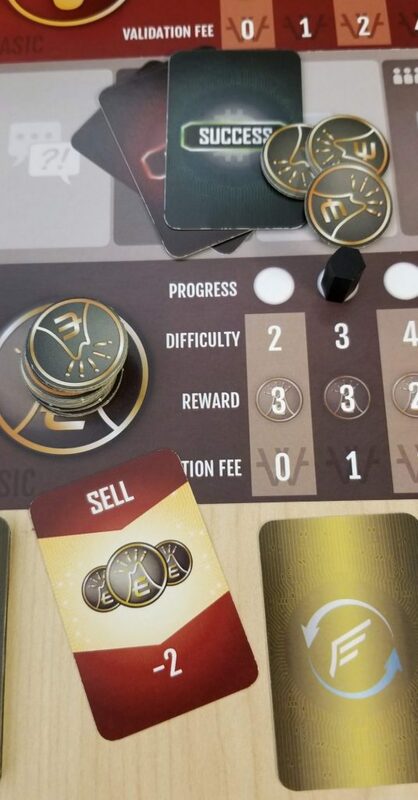 Alternatively, instead of Mining or Trading, a player may simply pass their turn which causes all of their Experts to become exhausted. 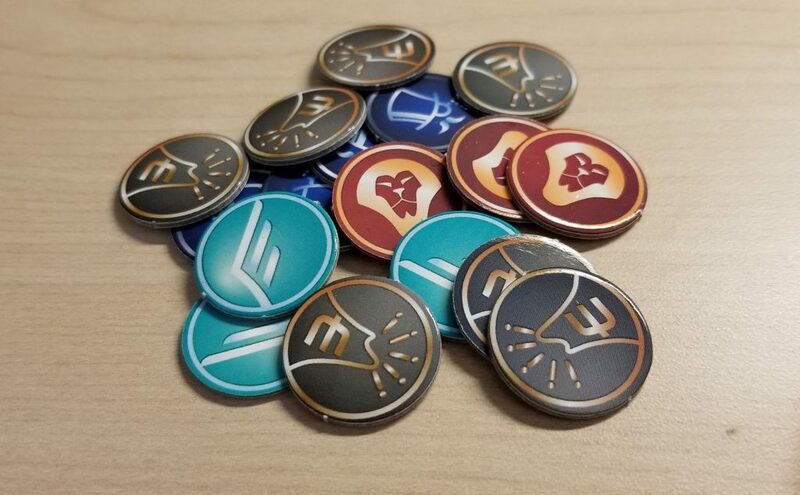 After each player has finished taking turns performing actions and all of their Team members are exhausted, an upkeep phase happens in which all of the Experts are refreshed and the interest on Loans is paid. If a player cannot afford to pay their interest, then they must give up one of their hard earned coins. Afterwards, a player can repay their Loans in full. Then, in reverse order, the players take turns playing the Rumor from their hand to one of the cryptocurrencies on the board. If the last rumor played to that currency was placed face down, the new rumor is played face up. The reverse is also true. Each currency can only receive a single rumor per round. If a rumor is played face up, then it causes the price tracker for that currency to shift up or down according to the Rumor card. The game ends once each currency has 7 rumors played to it – 2 which were played to that currency during setup and 5 more over the course of 5 rounds. Then an end of game scoring is carried out. First, the Ultimate Hodler rewards are awarded to the players that possess the most coins of each type of currency at the end of the game. Then the face down Rumor cards for each type of currency are revealed, moving the price trackers up and down accordingly. The least valued coin is then revealed to be a scam and all of the coins of that type become worthless. The remaining coins are sold off for their final values, any remaining Loan cards are paid off, and the player with the most cash at the end wins the game. In my review of Capital Gains Studio’s previous game Debtzilla, I spent some time extolling the virtues of the cheeky and humorous artwork in the game. That same art style is reproduced in Cryptocurrency by Wong Chun Xi and it is done very well. Whereas Debtzilla’s artwork was more on the silly side, the artwork in this game has a more Matrix-y, cyberpunk feel to it. These Experts in the game aren’t just hooked into cyberculture, they are literally HOOKED into it and it looks very, very cool. In that same review, I also ragged on the prototype component quality a bit. Well, CGS really nailed this prototype. The quality of these components is superb. If it’s any indication of what the final product might be, then the final product is going to look amazing. My admiration for this game goes beyond just the visuals, though. Cryptocurrency is a very clever game. Its mixture of press your luck and strategic planning occupies an interesting head space for me. I typically shy away from games that involve a lot of luck because it never quite feels like I am in control. With Cryptocurrency, though, while there are a lot of luck-reliant elements to the game, none of them are absolutely critical to doing well. Each different type of cryptocurrency begins with 5 coins apiece on the market board. Since it is possible to take out loans, it is possible to simply use your team of experts to buy up any coins that are there and then sell those back for a profit on a future turn. This requires zero luck to pull off and it is certainly a viable way to play the game. However, there’s no accounting for what your opponents choose to do. If they are not as risk averse as you are, by the time it rolls back around to your turn, those coins that you purchased might have become less valuable. While luck does take a role in this game, it doesn’t have to and I like the fact that such an option exists. 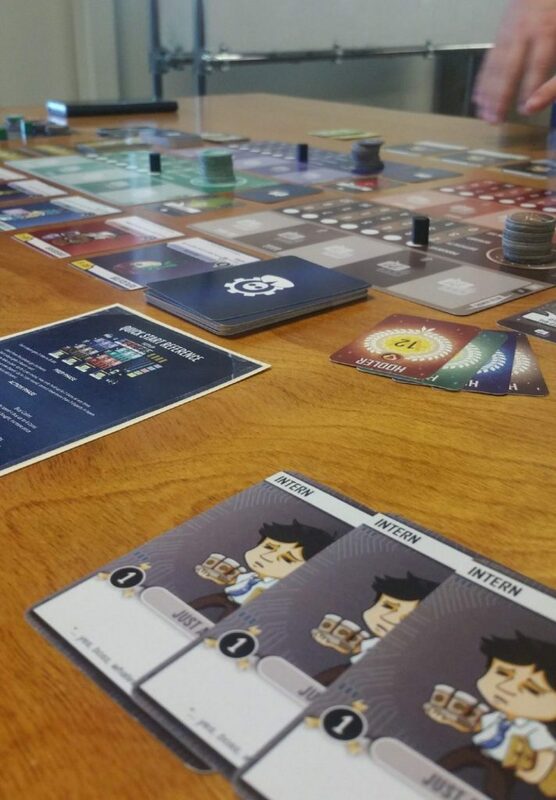 But let’s be honest – a game about investing isn’t as exciting unless you’re putting everything on the line, is it? The key to doing well at Cryptocurrency is to remember that it’s a game about making money and not necessarily about hoarding coins. Yes, the Ultimate Hodler cards can certainly boost your bottom line at the game’s end. But if you aren’t careful, you could wind up actually losing money. What’s an extra 12 Wonga when you could have sold all of those now worthless coins for 50 Wonga? It’s all about balancing risk versus reward and knowing when to hold ‘em and when to fold ‘em. In my various play sessions there were only a couple of minor negative issues that appeared and they were more “quality of life” issues than they were issues with the game play itself. 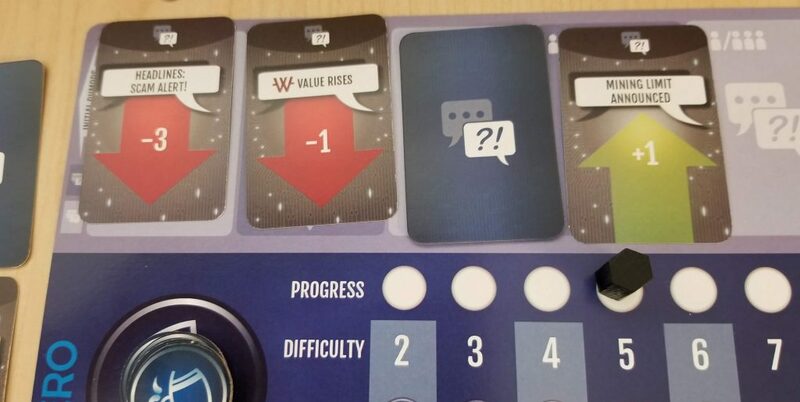 For instance, one player pointed out that the Transaction cards, when flipped, perform the exact same function as the Rumor cards so it didn’t make any sense that the iconography for raising and lowering prices was different on the two types of cards. This caused some confusion, but it certainly didn’t render the game unplayable. It was also commented that the penalty for an unsuccessful mining attempt (namely, getting nothing in return for your efforts) feels pretty harsh and that some kind of consolation prize would be nice. This issue becomes particularly prominent when every player tries and fails in the same round. It also seems like having only a single Rumor card to place each round is a missed opportunity. Having two in hand to choose from during each Rumor card placement phase would certainly make things a lot more interesting. All in all, though, I have really enjoyed playing this game. Not only does it provide an interesting educational insight into the world of cryptocurrency investment (there’s even a well written pamphlet included that relates game mechanics to real world concepts! ), but it succeeds in putting you right into the role of an investor trying to score big. Repeatedly throughout the game you will find yourself riding the high of a successful coin mining excursion and feeling the crushing loss of having wasted your efforts for nothing. And that’s a pretty accurate reflection of how cryptocurrency investing is in the real world. I think that Cryptocurrency is a pretty outstanding game and it’s one I’d gladly play any time.